Treat your family with this classic favorite that is easy and whole-grain seekers will appreciate, the rolled oats. This is the most requested oat cookies I've ever made. Using rolled oat and breakfast cereal (cornflakes, shredded wheat, cheerios, etc) or only rolled oat, these are great to work with. They hold their shape well while baking, not much spreading at all. You can lightly crush the oat/cereal if they are tough or s too big. They are wonderful. These cookies came out just crisp enough to be absolutely delicious. Not too soft, not too crisp. 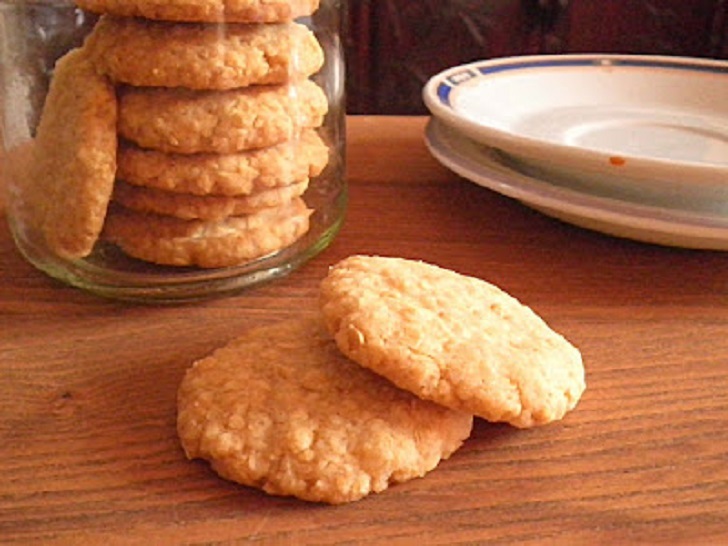 Will be keeping this recipe for my future cravings for crunchy cookies! Combine flour and baking powder in a mixing bowl. Add in rolled oat and breakfast cereal. Beat melted butter, milk with caster sugar until well blended. Add butter mixture into dry ingredients, mix until well incorporated. Shape into small balls, flatten slightly, transfer cookies onto ungreased baking sheet. Bake for 15-20 minutes at 160⁰C until crisp, let cool in the pan for 5 minutes. Transfer to the rack to cool. Store tightly covered.